I'm so sorry for not being able to send you this issue at the scheduled time yesterday. The Internet over here played up so much, that I had to give up after an hour and a half of doing 10 minutes' worth of tasks, only to lose it all in the end! Well, as a compensation, I'll surprise you today, as I have finally managed to get a photo with a friend of mine, whom you will recognize... at least many of you who took lessons with me at Web Suzhou, where Thomas taught you as well, before my arrival in September 2013. Remember him? 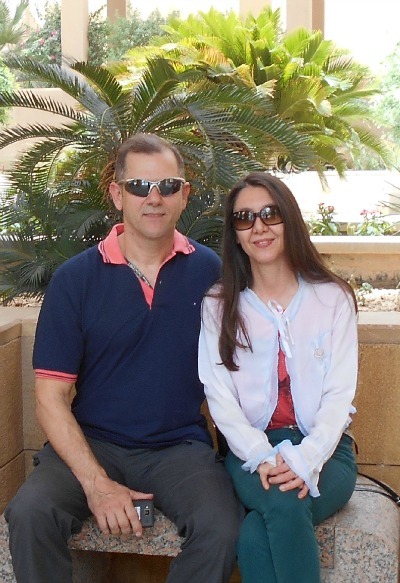 Nothing is going on - I'm sure some of you will jump to conclusions (don't, please :-D), but he proved to be a really good friend during this year, while we were both teaching in Ryiadh, but in different institutions. We spoke a lot about our students at Web - you should know you are fondly remembered and we wish to hear about your progress from time to time. I treasure when you write in and tell me how good you feel about your successes. You need to do more of this, you know? Do you remember cases when you wanted to speak not about somebody or something as such, but about something that’s been said or discussed at some point? When you want to tell somebody about the subject of a communication? How do you usually express that? OK my friends, this is actually our last lesson from the KSA. This doesn’t mean that the lessons will stop, but we shall take a short break and we’ll change the format of these lessons a little, in that they will be more practical from now on, including revisions of what we’ve learned so far AND we’ll start building some grammar muscle by doing some new exercises. We learned so far about the fact that building great content will enhance the profile of your website, by building your "Brand of One" and nurturing the relationship you have with your visitors, you build credibility and trust in your business. Offline or online, people prefer to do business with those they like. Today we’ll consider another component of the SBI system - Blog It!, which could be the perfect small-business compromise, especially before you implement full monetization. A blog is, at its simplest, merely a journal of entries that one makes on a web page. The most recent entries are sorted to the top, meaning that blog posts are sorted chronologically (as well as topically, with the use of categories), as is the case with a pyramid-shaped website. In addition, each entry has a "permalink" to the full post on a dedicated web page. •	the "newsworthy" subject matter. If you do, you will be able to incorporate a blog right into your SBI! site. More on that in Step 8. While blogging is only right for some small businesses (ex., those providing newsworthy content, usually on a daily basis), Blog It! gives you a useful (and easy!) way to let your visitors know "what's new." With the SBI! System all you have to do is set up Blog It!, then add your own custom styling if you wish. There's no new content to create. SBI! will simply, automatically reformat your newest content into "blog" posts! RSS/Blog It! is located in Site Central's BusinessCenter. By following its help and you can be distributing your site updates within 30 minutes! Bloglets, an important part of Blog It! One of Blog It! 's features are bloglets, updates you can create yourself rather than having the system do them. Some SBIers use bloglets to create customized updates when they publish new pages. Others use them to post news in their niche (ex., contests on their own or other sites). Still, others use them to curate content found on other sites. This allows them to help their visitors to stay current throughout their niche. It also lets them create fresh content on the Blog It! page even if they haven't published a page in a while. It is so versatile, so you should consider using bloglets for any of the above, or for any content you have that does not warrant a full page on your site. I shall start using this feature, once I start my journey later this month – it will be the part of the website where you will be able to keep informed of my moves and news. I didn’t use it so far, due to the time factor – I figured out I only had sufficient time to dedicate to our e-zine during this year, no matter how much I wanted to do more. Anyway, everything has a starting point, so let’s hope I can build a great blog for you here, by the end of this month. 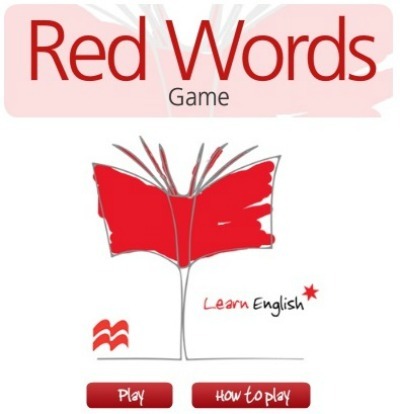 So, what’s this about “red words”? – I can almost hear you ask. Moreover, these words get stars, according to how frequently they are used. For example the most frequently used words will have 3 stars, then less, i.e. 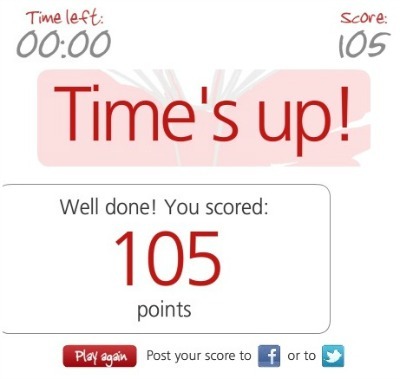 2 stars for quite frequent ones and 1 star for the less frequent red words you encounter in these dictionaries. The more frequent the word, the easier it is, which means the less frequent ones are more academic. Well, it is these ones you need to get used to apply in more academic essays, so it is important to be able to tell them apart. This game is for the player to familiarize him/herself with these words and make lists of special words, usable in some good writing pieces. 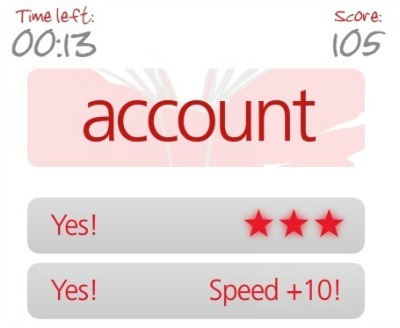 As you see in the rules above, you get the usual points, in this game 5 points, plus 10 extra points, if you answer correctly within 3 seconds. And basically it continues like this, until your time is up. 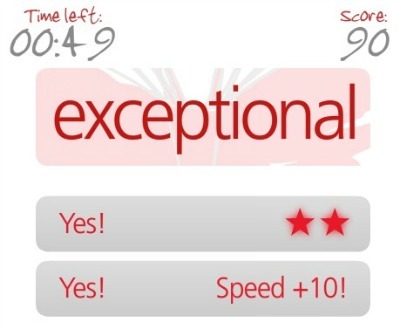 As you can see, ‘exceptional’ is a more complicated word (and more academic) than ‘account’, so it flags 2 stars. There’s no more philosophy to it, the secret is in the practice. The more you practice, the better your vocabulary gets. 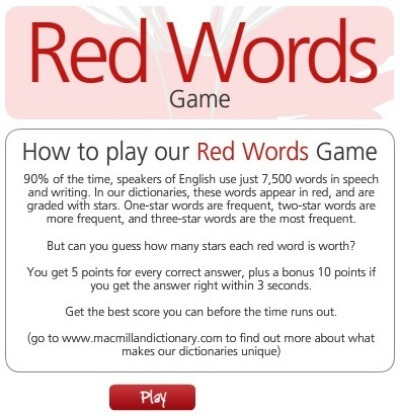 Personally, I can see the benefit of this game, especially for people who are trying to work with dictionaries outlining the frequently used words in red and with additional stars, for classification. However, I don’t like games which emphasize the use of words on their own and not in the context of a sentence or a paragraph. Words need to be learned and used in context, to avoid their misuse. Having said this, it is good every now and then, to think about the importance of a word, its popularity and frequency in daily speaking. This game is also good for improving your spelling. Well, this is it, from me, from the Kingdom of Saudi Arabia. I am so happy I could finish this issue tonight and I hope publishing won't be troublesome. Next time, I'll share our new format of the e-zine and I hope you're ready for some practice. Those of you who will be having a holiday will be able to benefit from some exercises the most. In parallel, I shall announce the new blog within this website, for the news and stories during my traveling.